Did you ever see the movie “Deception” that came out in 2008? No? It starred Ewan McGregor, Hugh Jackman and Michelle Williams. The cast alone should have made it a hit, but it bombed, critics hated it and audiences ignored it in spectacular numbers. Despite Hollywood’s addiction to stars and hype over content, the dirty little secret is that—Harry Potter aside—no one knows which movies will be hits and which will flop, until they open. Once actual ticket-buying people start to go to the movie, word quickly spreads about the experience people had, and they always tell their friends. This is what makes or breaks a movie, and everyone knows it. No one expected “The Blair Witch Project,” shot for under $100,000 to be a hit, but word of mouth sent it to a total box office over $248 million worldwide. The same is frequently true of books. It’s the experience people have reading the book that makes them want to share it with friends. And besides the content itself, the only other influence on the experience of reading a book is exercised by the book designer. There is no make up, no locations, cinematography, special effects, stereo sound systems, none of the bells and whistles that grab attention in a film. No the work of book design is quiet, always taking a back seat to the communication of what the author has to say, or the story she is telling. Which version would you rather read? To which one do you think reviewers or buyers will respond more positively? Which one do you think is likely to provide a better experience for the reader, and hence, more likely to be recommended to friends? In professional publishing circles—and that includes chain bookstore buyers, book reviewers, and other people you are likely soliciting for blurbs, reviews, or purchases—this is common knowledge and widespread. When you are preparing to publish a book, think carefully about whether the cost of a book design is truly a “cost” or whether it’s an “investment” in the book you’ve put so much into, and on which you may have a lot riding. You can only launch your book once—make sure it gets the attention it deserves. if you want positive word-of-mouth, getting the interior right is far more important than the cover. Unless you have professional graphic design experience, hire someone who does! For most books, you may find that you are ahead of the game by paying a professional to do the layout and typesetting. Yes, it will cost you — usually in the hundreds of dollars (but could easily exceed $1,000). You will have a more professional product (that will enhance the reader’s experience rather than detract from it) and will have saved yourself a lot of time and headaches. About a quarter of the self-pubbed titles we’ve reviewed have gone on to be republished by big presses, but I’d have to say that all of them are of comparable quality to traditionally published books–otherwise we wouldn’t waste the space on them. After many hours in book stores and libraries, the light bulbs began to pop in my head. Oh, so that’s how a beautiful cook book looks. It should not look like something produced by the church committee on a home computer – it should look like a professional publishing house produced it. Right – now the search for a graphic designer began. Wow!! I could not believe the transformation. I sold over 250,000 copies of “Fit to Cook – Why ‘Waist’ Time in the Kitchen?” It’s a guarantee that the book would not have sold 250 copies in its original format. —Denise Hamilton, Ink Tree, Ltd.
Self-published doesn’t mean slapdash. Don’t self-publish your book until it’s as good as you’d like it to be had a mainstream publisher put it out there. 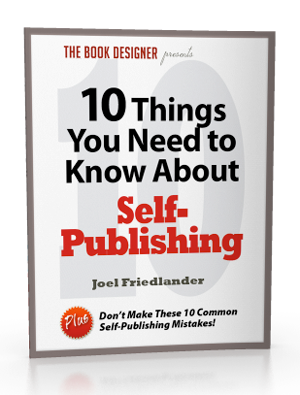 Self-publishing isn’t a shortcut to print. It’s an alternative business model for aspiring writers. You wouldn’t set up a bakery and sell cakes where the icing was all over the place and the body was sunken in the middle. So don’t think it’s acceptable to put your book out there with a bunch of typos and a cover made from Clip Art. As always thank you. I’m getting just about every information I’m looking for here. All great suggestions. I would say good book design is definitely an investment. The competition is fierce and one really needs a professional designer to know what will catch the eye of booksellers and book buyers as well as what will look professional and what will scream “amateur.” Thanks for all the helpful tips and links! Thanks Jean. I totally agree. And with the degradation of books due to ebooks and print-on-demand, I think savvy authors will “get” that one of the easiest ways to stand out in the growing crowd is to produce a book that is exceptional and professionally produced. No, I’ve yet to do my first e-book. I’ve been waiting for the e-reader sitch to chill a bit and settle. I mean, it’s obvious Kindle is here to stay–and the Sony Reader, too, I’d guess. In a perfect world, one standard would be king, as with video. Maybe that will come to pass yet, but for now, I’d choose Kindle, simply because I know mre people who’ve gone that route–as readers, that is, not book production people. Just lately I’ve decide to explore the process of translating some of the books I’ve worked on–only as learning projects; they’re not my copyrights to play with–to see how some of my real-life work carries over. I’ve decided to work on three samples: straight text, heavily illustrated (photos and drawings), and technical material (with equations and tables). Of course, I’ll blog about it. That all said, Joel, the next time my wife and I are in Marin (from NY), visiting our grandgrrrls and they’re mom and dad, I want to time it for a BAIPA meeting. Preferably their annual jamboree. It’d also be fun to sit down with you and have a cup of coffee and a real conversation. Tho’ I’m halfway active online with freelancing colleagues, I’ve yet to sit and have a face-to-face with any–not even by videoconferencing, both of which would be great. I’d love to know how your “translations” work out, will you blog about your results? That would be interesting, and I like the scope of your plan. Our next BAIPA meeting is October 10, but just let me know, it would be great to have a cup of coffee and chat. And thanks again for your comments. @Stephen, absolutely, readability is king. The ebook situation is in such a state of flux it’s hard to be sure where we’re going to end up. Looking at a Sony Reader at Border’s today, some of the screens I looked at were just like my Helvetica sample above. Designers need better and more stable tools to work in the ebook space, it seems to me. Have you done any ebook designing? Tho’ readability will always be paramount, I think design grows more important with each bit of technology that goes into making books. And now with e-books rising, it will become a trickier proposition: readability first, but also something attractive to the reader (and not so “interesting” as to be a distraction). It’s as simple as the two sample pages shown above, too plain and page after page swims before the reader’s eyes, hurting readability. Thanks so much for mention — though I should give credit where credit is due. That particular tip was captured from a panel of agents at the Writer’s Digest Conference in NYC. The panel focused on what it takes to make the leap from a self-published work to a traditional, mainstream deal. One of the agents said a professional looking package and sharp design was a consideration. There were other people at the conference who disagreed, particularly indie author April Hamilton. She argues that everyday readers don’t particularly notice design unless it’s difficult to read. (And I guess this is where the debate comes into play—what is difficult to read, what is aesthetically pleasing to read, and who is the audience that’s making the call.) If you’re trying to get noticed by literary agents or other industry professionals, then you should take professional book design seriously to make a good impression. Yes, and it’s even more true when it comes to covers, of course, but I’m always surprised that many new publishers overlook or minimize the importance of making their porridge look so yummy it’s downright irresistible. As a reader, I know I certainly appreciate the book designers who do a good job at their craft. These are important points for the independent publisher. I agree, text design is important in the packaging of content. I think its like food design – making it look great to eat. No one wants to sample a slurry of porridge – even if it tastes great and has all the right ingredients! Yeah, I know many people find exactly those things a complete headbender,. There is, of course, nothing to stop someone who’s self-publishing hiring someone who IS OK with it, though (but they’d have to be very sure of their return!). It’s another reason why people considering self-publishing have to do some serious soul-searching. There are lots of pitfalls – but thinking of them in advance, and planning round them will go a long way to alleviating them. All the topics you mention are what overwhelm many people who try to do this themselves. Software is really not much of an answer. The best software at the moment to design and layout books is InDesign. But because it’s a professional-level tool, it has waaaay more options, features, and variables than you really need to learn. The learning curve can be humbling. So I often reply to people who ask, would you learn cinematography if you were only going to make one movie in your life? And given the fact that most people’s first attempt at something really isn’t all that good? What have you saved? Your advice to look at the books on your shelf is a good one. Many mistakes could be avoided if people just looked at all the examples they likely already own! Wow, thanks for the mention, Joel. I’d be interested in knowing what people thought about the software packages that claim to do this for you. I formatted my interior in Word, and it was absolutely fine – after about 10 hours of work. AND I learned a whole bunch of stuff about creating different sections for pagination, formatting page numbers separately from footnotes, all kind of things that will probably do me more career use in the long run than having a book! One bit of advice I’d give. Some things are givens. No typos, for example. And not having pagination until you start the body of your text. But equally important are the style things (the stuff your publishing house would have a layout person rather than a proof editor look at). Things like how to format your name and title on the top of the page (same font as the text? Or something differnt? Maybe the same as on the cover? ); your style for starting new chapters (a grand first letter of the first sentence; a centred bold number; a written-out number in same/different font). For these things, I would recommend you look long and hard through the 50 or 60 books you’d like yours to sit on the shelf with most, and see how they do it – what appeals to that kind of reader? And then DON’T just pick and choose one thing from here, another from there. Look at the impression it conveys. And then we come to things like representing instant chat on the page; and differentiating it from blog comments and, well, it’s hard work! But you can do it with diligence and a good eye. And if you’re lacking either of these, you need to do it through someone who isn’t.